Viewsonic has announced the availability of three new projectors, capable of displaying 3D imagery, for the consumer and business markets. The first, the PJD6381, has a very short 'throw ratio' of .68 and is compatible with interactive whiteboard applications, so schools and businesses can catapult themselves into the next generation of presentations. It comes with 120Hz refresh rate to sharpen pictures, and 1024 x 768 XGA resolution, with a bright 2,500 ANSI lumens output and a fairly deep 2,500:1 contrast ratio. 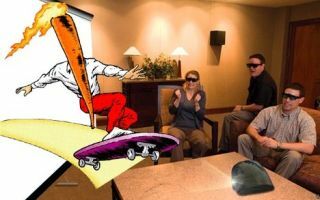 It uses glasses to enable the 3D option, which is brought about by Texas Instruments with DLP link and N-Vidia's 3D-Vision. The PJD6381 will be available in August for $1,249 (around £760), although there's no word in UK availability as yet. The others in the range, the PJD6211 and PJD6221, also come with 120Hz refresh rates and the 3D system from Texas Instruments and N-Vidia. These projectors both have a 1024 x 768 XGA resolution, up to 2,700 lumens and a 2,800:1 contrast ratio. These will be available in July for $849 (£560) and $999 (£600) respectively.